Designed for high-purity applications,TYGON® SPT-3350 Sanitary Silicone Tubing's ultra-smooth inner bore can reduce the risk of particle entrapment and microscopic buildup during sensitive fluid transfer. 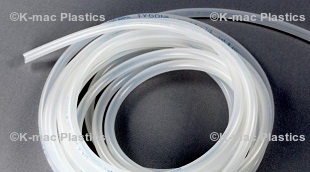 In-house analysis of the inner surface of TYGON® SPT-3350 Sanitary Silicone Tubing compared to other silicone tubing shows that it is up to three times smoother. Additionally, this smoother fluid path facilitates complete system cleaning and sterilization. Utilizing a platinum-curing process, TYGON® SPT-3350 Sanitary Silicone Tubing eliminates the concern of extraction often encountered when alternative curing methods are used. It has also been fully characterized using the ISO 10993 standards, reducing user cost and time associated with process validation.